The term reflection actually encompasses three entirely different types of optical phenomena. These three kinds of reflection are specular reflection (like a mirror), diffuse reflection (often called Lambertian) and reflexive reflection (or retro-reflection). Specular reflections are those we normally associate with a highly polished surface, such as a mirror. In technical terms, the angle of incidence of the light is equal to the angle of reflection of the light (see figure 1). All materials obey the law of reflection when viewed at a fine enough detail. It is the specular reflection which is responsible for forming an image in a shiny surface. It also results in a bright spot, called a specular highlight, when a small light source is at such a position that it can reflect into the eye. Specular reflections. Ji (angle of the incident light ray) is equal to Jr (angle of the reflected ray). N is the normal to the reflecting surface. Most objects are not mirror-like but have some degree of surface roughness. Hence, the reflections we observe are a composite of those from numerous surfaces oriented at varying angles to our line of sight (figure 2). The overall observed reflection becomes the sum of the individual reflections (figure 3). This is characterized by a distribution known as the Lambertian distribution. Diffuse reflections do not result in an image being formed, but yield a large bright patch on the surface being illuminated. The law of reflection is observed, regardless of the surface orientation. Lambertian distribution is a sum of reflections in all directions. The phenomenon of reflexive reflection is used commercially in making safety products, such as armbands and night visible speed limit signs. It occurs whenever the structure of the surface is such that light striking the surface is preferentially reflected back in the direction of the source. This occurs for surfaces coated with fine beads or for structures such as a so-called corner cube, which were used on the moon to reflect laser beams from the earth back to sensors for the purpose of precisely determining the distance to the moon (see figure 4). Reflexive reflections are seldom encountered in display applications and will not be considered further in this discussion. Reflection from a corner cube. Glare is the phenomenon by which an ambient light incident directly on the user’s eyes causes a loss of ability to use a display. As such, it is a function of the lighting environment and installation and not a property of the display. This subject is discussed in greater detail in our Antiglare vs. Antireflection white paper. Specular reflection, as described above, is the image forming reflection. This is the cause of the “white shirt” effect often seen in service. 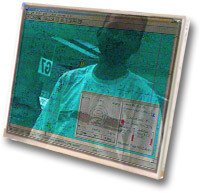 A user or observer standing to one side of the display, but in a bright area will cause a distracting image to be seen when viewed from the other side of the display. Several solutions can be used to minimize this effect. The display can be re-oriented so that the image is not visible at the primary users location. This is facilitated by the use of an adjustable mounting arm when the display is installed. Alternatively, the ambient lighting in the vicinity of the display can be controlled so that annoying reflections do not occur. However, this is often not feasible. In the final (and best) approach, the front of the display can be coated with an antireflection coating to reduce the reflections to a minimum. Available coatings can reduce the specular reflection from about 4% of the ambient light level to less than 0.5%. In those cases where this is still too great a distraction to the user, the surface of the display can be chemically or mechanically etched to create a carefully controlled surface roughness. This is commonly called an antiglare treatment. The antiglare treatment results in increasing the diffuse reflection while breaking up the specular reflection. The result is that the “white shirt” is now just a large whitish blob of low level. This is frequently deemed to be more acceptable than a specular image. This surface treatment, in addition to altering the ratio of specular to diffuse reflectances will cause a greater or lesser degree of blurring of the image. It is the task of the designer, working with the user, to define the degree of antiglare to be used. Reflections from a display are a fact of life. By careful design of the display and installation, it is possible to produce a display with adequate luminance and contrast (for both specular and diffuse reflections) to allow the user to comfortably read the display and take action on the data so obtained. General Digital Optical Bonding Laboratories is highly competent in this area of technology to guide you in selecting the best possible display for your application.